You will also need a pen and a rubber band. That is all you need and you can have the construction done in only 5 minutes. This is just my spin on the Special Delivery card trick originally created by Bill Severn and Pete Biro. This trick is widely available in most libraries around the world. When people ask where the inspiration for these magic tricks originates, I say the same thing: library books. There is so much fun and interesting material available to you if you are willing to put the effort into searching it out in your local library. Even if that is too much effort, there are so many great resources you can access online for free. Don’t be afraid to explore. This is a great way to learn a lot and pick up so many great new principles. I use these books to find new presentation angles and some great gags and one liners to add to tricks. 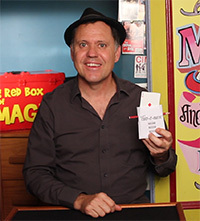 When I stumbled upon, what would eventually be called the Card-O-Matic Trick, I realised that I only had to give it a new look and find a fresh presentational ploy that will inspire others to try out the trick. Are you tired of card tricks that go this way, that way, anyway but the right way? 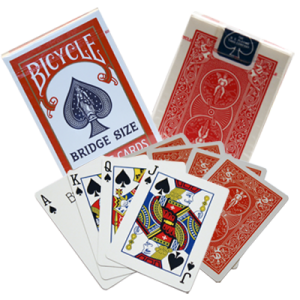 Then you need Card-O-Matic, the only card trick with the patented forward and reverse buttons. We’ve all had those days when you get the angle of the card dangle all wrong … ooops! … someone isn’t using Card-O-Matic. Simply push the reverse button … another day, another happy customer. If your card is unable to move for some reason while you are twisting the pencil, I’d suggest that it probably has something to do with the rubber band being unable to make contact. If this is the case for you, squeeze the packet gently as you rotate the pencil and that should help. Did you enjoy this Card-O-Matic Trick? To learn more simple magic tricks Click here! This is a re-run of an old trick that was performed many months ago ……… while I like the trick, I’m hoping that you’re not running out of material (smile)! You have ‘The Magic Mailbox’ download instead of ‘Card-O-Matic’ download??? Card-O-Matic download does not come up. It brings up # 75. Hi: I used this idea back in the 70’s. I used a Svengali deck to force the card. I placed the deck inside an envelope. I picked up a pencil, covering the rubber band. I called it my magic wand. Everyone laughs & informed me that it was a pencil. I thrust the pencil through the envelope. I requested the spectator ask that their selection would rise up. I would raise the wrong card. They would say that it was the wrong card. I would explain, see you called it a pencil. Pencils make mistakes. That is why they put an eraser on the end. I then would have them tell the magic wand to exchange the selection & bring up the selected card. When done, their card rises for the finale.